Lesson Plan in English-Charlotte H.S. Ambassador Samantha Power, US Permanent Representative to the United Nations, was honored at the first anniversary celebration of the Jan Karski Educational Foundation at the Consulate General of the Republic of Poland in New York with the Spirit of Jan Karski Award for her exemplary work in advancing the issue of genocide prevention. Polish Consul General Ewa Junczyk-Ziomecka, who received the first Spirit of Jan Karski Award in 2012, welcomed distinguished guests including Ambassador Ryszard Sarkowicz, Permanent Representative of the Republic of Poland to the United Nations; Ambassador Power's parents; David Harris, executive director of the American Jewish Committee and a member of the Advisory Board of the Jan Karski Educational Foundation (who later presented the award); the Board of Directors and members of the Advisory Board of the Jan Karski Educational Foundation. The Consul General pointed out that the Consulate is located at “Jan Karski Corner” and that the famous Karski bench in front of the Consulate serves as a reminder of his legacy. Foundation President Wanda Urbanska, who served as master of ceremonies, read an excerpt from the letter from the Ambassador of the Republic of Poland to the US, Ryszard Schnepf. He congratulated Ambassador Power for her actions to combat genocide around the world while lending his support to the foundation. During his unscripted, eloquent presentation, David Harris brandished an autographed first edition of Jan Karski's Story of a Secret State and a report from the Polish government-in-exile addressed to the Allies on December 10, 1942, regarding the mass extermination of the Jews in German-occupied Poland – two of his most cherished possessions. 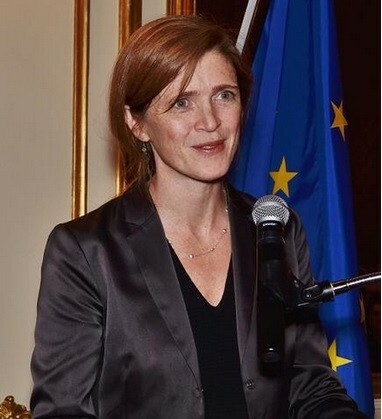 “To appear in the same encyclopedia as Jan Karski, never mind the same chapter, paragraph, sentence, is incredibly humbling,” said Ambassador Samantha Power during her powerful acceptance speech. She said that Karski was a hero, whose legacy will be sustained. She also invoked Rafał Lemkin, a Polish lawyer of Jewish heritage and the creator of the term “genocide”. Lemkin, who lost dozens of relatives to the Holocaust, advocated for the first-ever human rights treaty. Andrzej Rojek, Chairman of the foundation’s Board of Directors, presented the educational goals and the vision of the foundation. He mentioned that thanks to the foundation’s efforts, the Chicago Public Schools has placed the Story of a Secret State on its recommended reading list while inviting others to follow the lead. A stirring piano recital by a Polish-Canadian pianist Katarzyna Musiał, followed the award ceremony. Then, the guests had an opportunity to savor authentic Polish cuisine and participate in a Silent Auction of works of Polish and Jewish artists, such as Janusz Kapusta, Rafał Olbinski, and Ryszard Horowitz. All proceeds from the silent auction will benefit the Jan Karski Educational Foundation. Click the link below to read Ambassador Samantha Power’s speech in its entirety. Subscribe to our newsletter and receive news and updates from JKEF directly to your inbox.